When the weather gets hot, sometimes people feel very limited by the wines they can drink. White wines are typically a “go to” since they can be served chilled. However, Rose wines can make an excellent option as well as lighter style reds. This past week I was at the Cornell Club in New York City talking about this very subject. It was a great tasting with around 50 very interactive people. We covered not only summer wine styles but went into wine an food pairing, the reasons for ancient cultures’ additions of wine to water as well as my current views on the challenges of marketing wine in Asia. I won’t go into the full discussion here but I will tell you. This is a great go to wine for the summer. It is reasonably priced, deliciously crisp, and has a light body that even the most discerning of wine drinkers will enjoy on a hot day. It also works well for those summer cocktails that call for something bubbly. This is one of my favorite Rieslings from the Finger Lakes. Bright acid and a dry palate make this wine perfect for humid summer night sipping. The aromatics are very minerally and the fruit shows up on the palate as a mix of tropical and stone fruit. This rose comes from one of my favorite Pinot Noir vineyards in California, Grace Benoist Ranch. I was fortunate enough to make wine from this vineyard in 2010 although it didn’t end up getting in a bottle by itself. This rose is full bodied with crisp acid and lovely flavors of ripe strawberries and peaches. It is a great wine for a meatier summer dish that would be too savory for a white wine but when a red would be too heavy. Beaujolais some times gets a bad rap because of the Nouveau phenomenon however many of the Cru level producers are turning out very respectable wines that are delicious in the summer with a light chill on them. The tannins on this wine are soft and supple with a light palate and floral nose. This was a surprising wine. Of all the regions within New Zealand, Hawk’s Bay would be my last pick for Pinot Noir. It is considered a warm spot in a cool climate ideally suited for Bordeaux varieties and Syrah, particularly from the Gimblett Gravels area. However, high up in the hills, there are Pinot Noir growers who are working with this variety at high altitudes. It is very similar in style to Carneros with dark, juicy fruit and moderate acid for a Pinot Noir which tends to be higher overall as a variety. The soft tannins also allowed it to take a slight chill for the tasting without losing any of the complexity of the wine. Finally, one can not really talk about things to drink in the summer time without talking about Beer! I was on vacation in the Poconos, where I spent the rest of the week while not in NYC, and nearby was this fantastic Craft Brewery called Shawnee Craft. I became quite enchanted with their Biere Blanche, an unfiltered “Belgian-style wheat beer” with a citrusy nose and wheat driven palate. They also had live music on Friday night that consisted of a talented guitarist with moderate singing ability and two percussionists, making for a lively jam session. I miss the beer. Perhaps they ship? 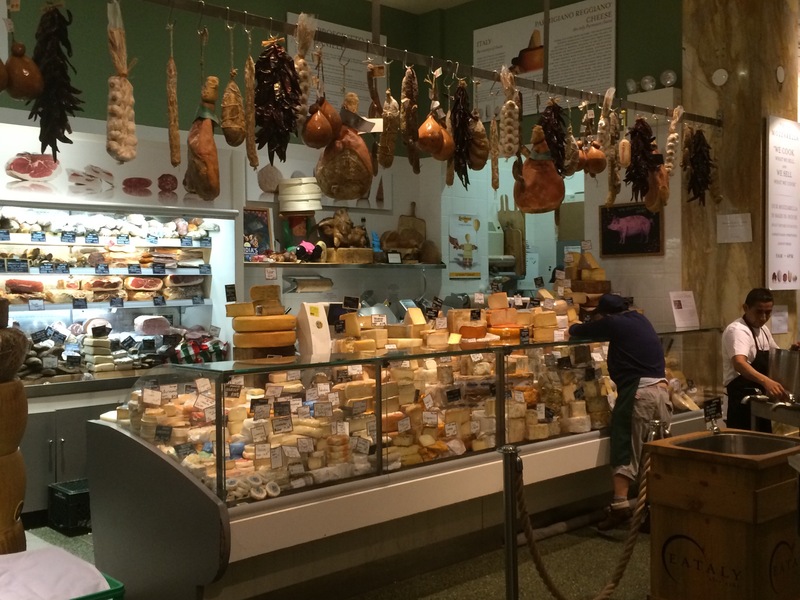 The cheese selection in Eataly in NYC was amazing by the way. I though I would share! Very often I get questions about decanting wine. Which wines would benefit from decanting or why would one choose to decant. This week on Fix.com was a brilliant article written by Zachary Sussman outlining in nice brevity exactly the how, when, and why of decanting. The link to the complete article is here. 1) Decanting is extremely important for older bottles particularly if they have sediment. The graphic on the article does a great job of explaining how to pour off the sediment. 3) An empty bottle of wine can serve as a makeshift decanter in a pinch. I can’t tell you the number of times I’ve found myself without a decanter at a tasting and used an empty bottle of the same wine instead. Not as fancy but gets the job done. Why does all this work you may ask? A 2012 journal article published in the Journal of Separation Science (Really? There is a whole journal devoted to this?) was able to detect 20 different organic acids and polyphenols in wine that showed different forms after decanting than they had before. The concentrations of these 20 compounds also decreased after decanting as well. They also noted that the duration of decanting, temperature, and light intensity would add to the effect of decanting overall. Long story short? Read the article (Hopefully I haven’t stolen too much of his thunder) and experiment with decanting at home on your next bottle! 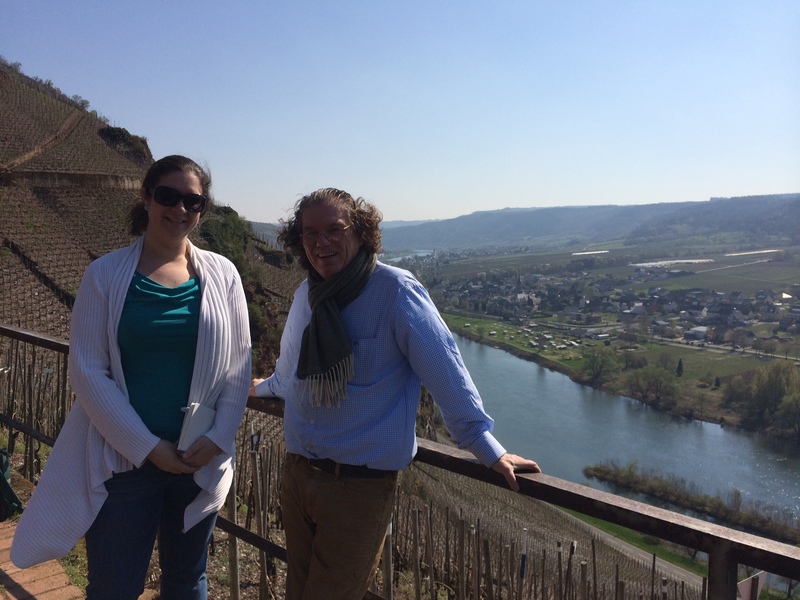 Our final stop in Germany was, of course, the Mosel. None of the pictures prepared me for the sheer beauty of these vineyards. Steep slopes dug into rock with little but rock for soils in the best sites. Iconic German architecture reminiscent of Oktoberfest in quaint villages tucked along the stunning, swiftly flowing river was a sight to behold. Our first stop was to Weingut Willi Schafer, an unassuming building tucked away in a relatively residential looking villiage, where we were hosted by Andrea Schafer. We tasted several bottled wines first then toured the cellars afterwards to taste the most recent vintage. All flinty and minerally with a linear palate that is weighty and lean at the same time. Lemon lime fruit and a hint of white flowers with 70g/L residual sugar cut through with racing acidity. Warmer fruit than the 2004 with fresh apricot, lime zest but continuing with minerality on the palate, 70 g/L residual sugar and racing acidity. Andrea told us that the most recent vintage (2013) was more suited for the off-dry style due to a high level of botrytis influence. “We make the wines but nature decides what style we will make.” They try to interrupt the fermentation at the right time to achieve the proper balance in the wines. “When you have too much sugar you lose the elegance and the terrior.” We asked for her interpretation of the different styles of Riesling and she gave us the following. 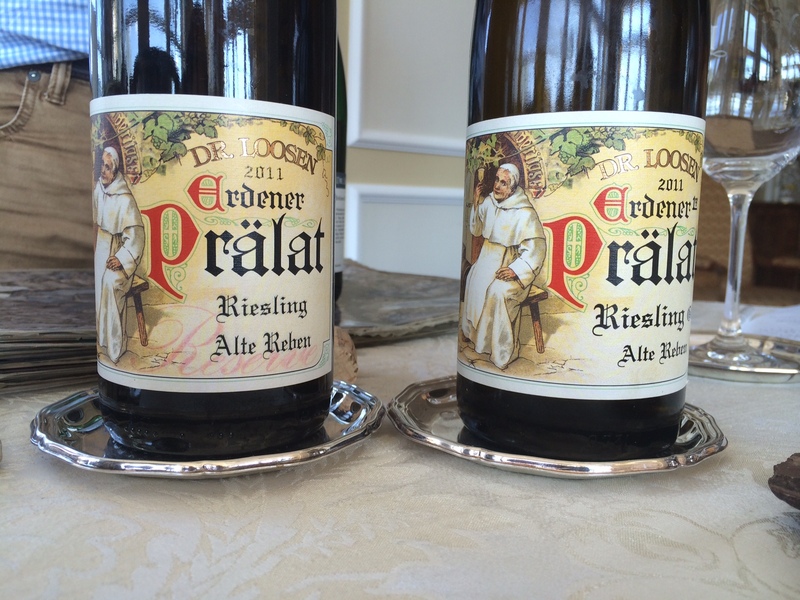 Kabinett – Light and fresh in style with less richness than Spätlese. 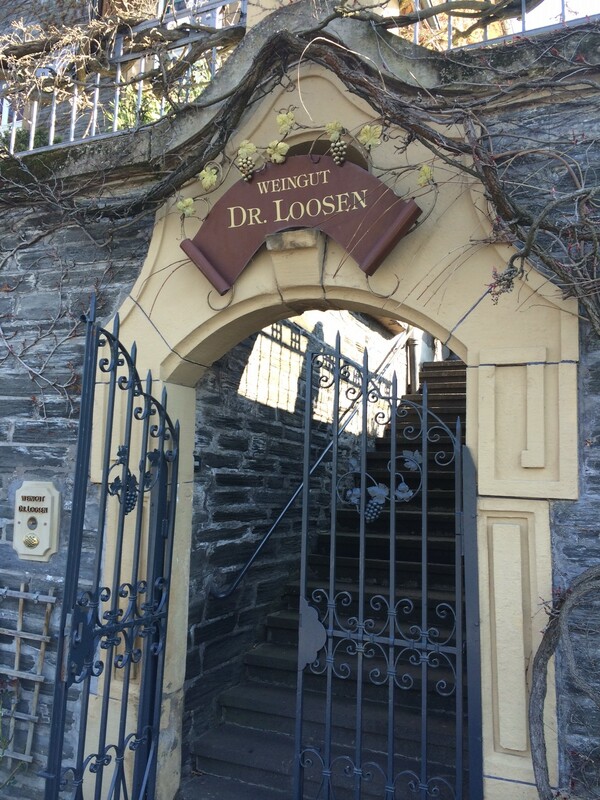 Auslese – More honeyed notes and a very rich style. Spätlese – A lighter more spritzy style than Auslese but with extra richness and depth above Kabinett. There were two top highlights of my trip to Germany. The first was an amazing dinner with Dr. Uli Fischer of the Neustadt Research Institute with awesome food and conversation that ranged far beyond wine to economics, philosophy, sports, politics, religion, and every other topic under the sun. 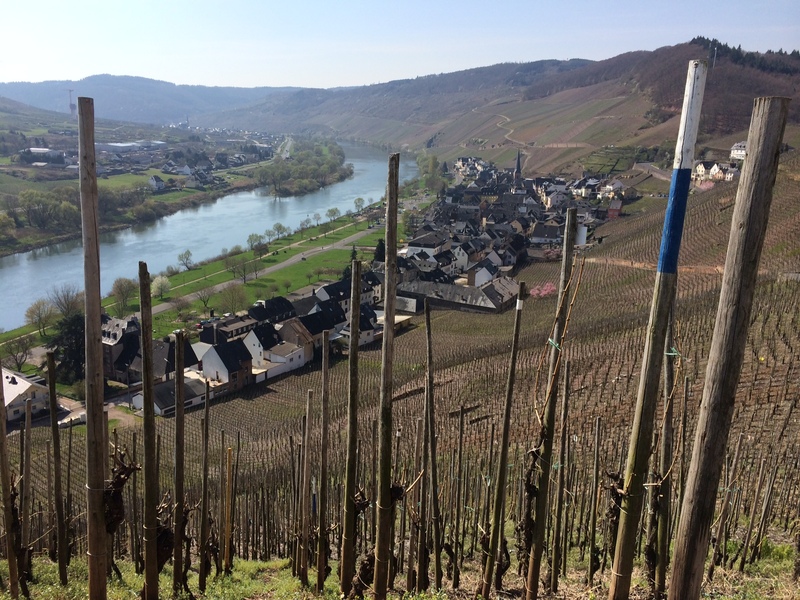 Our next stop in the Mosel was definitively the other top moment. 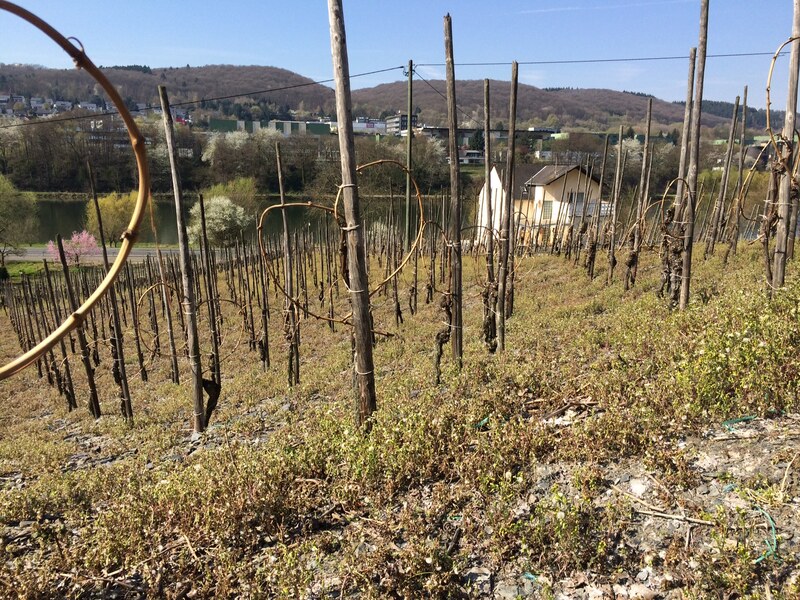 We were treated to a personal tour of Weingut Dr. Loosen with Ernie Loosen. He first took us for a quick jaunt around their vineyards in his Range Rover. They own 10 hectares split into 184 different parcels, the smallest of which is 15 vines. This is of course thanks to the Napoleonic code that affected both Germany and Burgundy very similarly. The government in Germany, however, is trying to remedy the situation by introducing a “reorganization”. They are killing several birds with one stone in typically efficient German fashion. Each vineyard involved must have buy in by a majority of the owners of the vines. The owners agree to give up a maximum of 10% of their land to the government to build roads to traverse the steep slopes for machinery to be more easily moved about. The government builds the roads and regrades the slopes to allow for mechanization with crawlers. Each of the owners then gets a consolidated section of the slope equal to 90% of the number of vines they owned prior to the consolidation. The upside is the vines are now all together rather than spread out over the slope and are able to be mechanized to some extent. The un-reorganized slopestake 2-3,000 manhours per ha and the reorganized slopes take 1/3 of that time. The downside is that it is expensive costing $30-40,000 for the vines however the government is subsidizing this and offers the ability for the owners to pay the balance with a 10 year interest free note which is held by the government itself. With a labor shortage being the biggest problem in the Mosel any level of mechanization is helpful. It takes a single crew a full day to pick the equivalent of 1.5 acres because of the treacherous slopes. Standing on top of them I wondered why anyone would be willing to haul grapes up and down them. Another downside? How can you be sure the vineyard will not be changed? Ernie assures us that not all slopes will go through with this plan just for this reason but it is a huge undertaking for those that have. After our vineyard tour we went back to the tasting room and went through several amazing wines. Very elegant and fruity with a subtle minerality. Flavors of white peach and apple with zesty linear acid. Fermented with indigenous yeast in a 1000 Liter Füder with 12-24 months on lees. More spicy and floral, almost Gewurztraminer like with fresh acid and a rich palate balanced by a steely mineral backbone. Ernie stated that these two wines needed lots of air to show their best and generally needed to be open for 3 days to fully experience the flavors. He is also working on lots of different winemaking techniques in the winery such as extended lees contact as well as different types of fermentation vessels. He offered as an example where after the 3rd century the Romans switched to oak barrels for fermentation because they showed better quality than the amphoras. “We need to learn the old ways so we can make them better” when talking about reviewing ancient winemaking practices. Fruit from 120 year old vines planted on a steep, rocky red slate filled, southern facing slope of the Mosel fermented in neutral oak and aged on lees for 12 months. This wine is highly complex with intense aromas of white flowers, peaches, and slate with a rich sweet profile with enough acid for a dry finish. The palate brings spiciness reminiscent of pepper and cinnamon with intense weight. GO FIND IT!!! It’s amazing and a wine which every winelover should experience once at least! Restrained nose with flavors melon and tropical fruit with all the richness on the palate of the sweeter translation above. The finish brings more mineral characters and additional tropical fruit notes with slightly less spicy intensity than the reserve. Amazing intensity for fruit with pineapple, melon, grapefruit, and honey complemented by an equally intense rich palate which is weighty and long. It is sweet at 110g/L but is easily balanced by the zesty 9 g/L of acidity! All in all it was an amazing day and a fitting end to a whirlwind trip through Germany’s three wine regions. I can’t wait to go back to spend more time getting to know the wines and the people who make them.